In these circumstances, the time came when Master Chee, a young man with a reputation for extraordinary Gong Fu fighting skills, came to the attention of the Very Reverend Abbot of the famed Southern Shaolin Temple at Putian (Fujian Province). Concerning this Abbot, honoured by many legends and publicised by even more Gong Fu cinema films to the Western world, not much is known, but what little there is evokes a picture which fully supports the most impressive concepts of the heights of Gong Fu skills possessed in pre-1949 China. The Abbot was blind, yet, through some exceptional gift given due to the extreme and harsh rigours of his own training in earlier years, could tell when a student failed to correctly perform some stroke or the movement of a form; when this occurred, according to Master Chee, he would swiftly strike the erring pupil savagely with his stick, to show his displeasure and help correct the error. 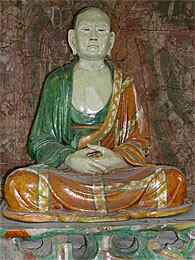 It must be realised that the Abbot, in spite of his blindness, could accurately tell the identity of the person who approached him at all times: when Master Chee entered his presence – no matter how careful he was to dissemble his identity – the Abbot would call to him; ‘enter Chee,’ or ‘what do you want, Chee’! The Abbot, the Very Reverend Yik Cha’an Cha’an Sze was in his 80’s when Master Chee was personally invited to become his pupil, following the passing of a test the Abbot arranged; through sending his Number One disciple, unannounced as to who he was and the purpose of his challenge, to fight him. This fight, which occurred one evening while making a visit to his family, was the most significant of all in Master Chee’s early, formative years, and ended in an honourable draw in which the Abbot’s most senior disciple used all his gong fu skills and strategies to defeat his opponent, but failed. Dusting himself down, young Chee’s assailant announced himself, and the purpose of him who had sent him, in so many words: ‘Very good! You are clearly the man I had been sent to find.’ After the challenge, the monk returned to the Abbot, saying that he was unable to defeat Chee. The Abbot, then sent a personal invitation for Master Chee to go to the Temple. The Abbot said to Chee, “use all of your Gong Fu skills, and all that you have learnt, to try to move me, and if you are able to move me then there is nothing that I am able to teach you.” He was unable to move him, and the attitude of Humility and Respect of Chee, before the Abbot, secured his admission to the Temple, where he was to be taught personally by the Abbot himself.